Being in the hands of the military, the opening hours change. It used to be open daily, all day. A couple of years ago the castle was open for certain days of the week from 9am to 5pm. For update opening hours check with the local guide. There is no admission to the castle. The car parking area is a clearing on the hillside with a solitary olive tree that grows in a stone planter ring across from trilingual marble memorial to the victims of Turkish Airlines aircraft who perished in a crash in 1988. A small aircraft, approaching Ercan in misty conditions failed to clear the ridge above and fell apart nearby. Having a glance upwards to the mountain top, Buffavento is plainly recognizable among the rocky peaks. At first glimpse it would seem that climbing to the top requires the skill of mountaineer. However, there is a gravelled pathway that winds on a fairly gentle ascent up the slopes. It is steep but gradual. For those who want to scale its height walking stick, bottle of water, camera or binoculars are recommended. Remember to wear proper stout foot ware. To make a trip to the peak takes about 30 or 40 minutes, with stopping from time to time to admire the view and in spring to seek out the wild flowers that colour the hillside. If you wonder how the castle got its name, you will learn that after climbing on the top. Buffavento means "buffeted by the wind" and at the altitude 940m it is said to be perfectly positioned for the views on Cyprus . 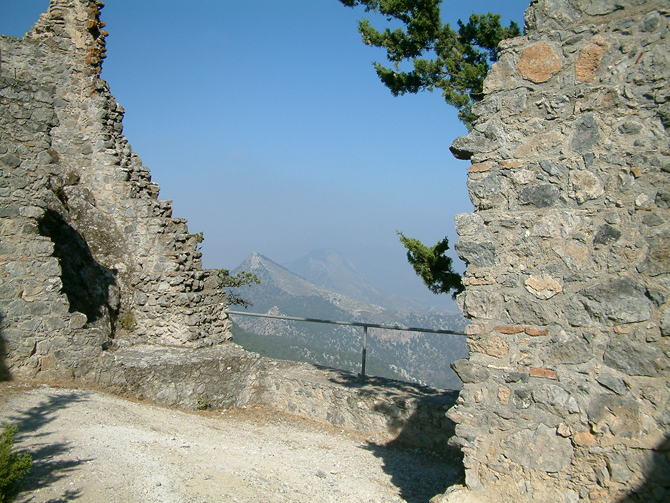 Kyrenia, Nicosia and Famagusta are all visible in the right condition, just alike the Troodos mountains and actually the half of the island. 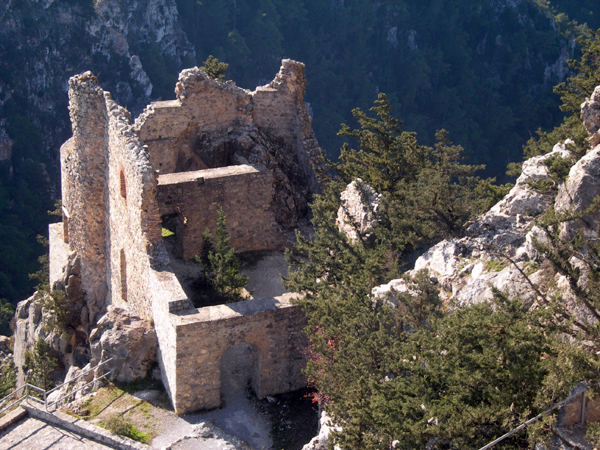 Buffavento is the highest and most cleverly constructed of the three mountain castles in the Kyrenia Mountains . 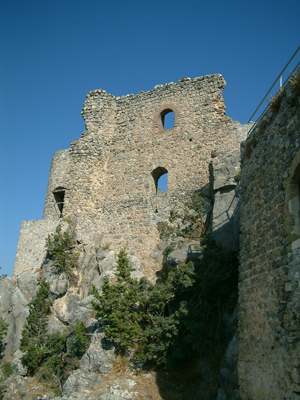 The castle was probably set as a Byzantine watchtower in the 10 th century and was surrendered to Guy de Lusignan in 1191. It is known that there existed a fortress of some type here before Richard the Lionheart seized the island from Isaac Commenus. In medieval times the castle was known as the Lion Castle, but its origins are less prosaic and little is known about its early history. The first definite proof comes from 1232 when the wife of Balian of Ibelin took refuge in Buffavento while her husband was campaigning against the attempted occupation of the island by Frederick II. Because of the position that is hard to access, the castle was used as a political prison to hold those found guilty of particular crimes against the state. Among these was naïve John Visconti who had tried his friend King Peter I of the Queen's infidelities only to find himself disbelieved and found guilty of slander. First he was tortured and put into prison in Kyrenia, later transferred to Buffavento where he starved to death. Buffavento was also used as a lookout for approaching ships that might have brought danger to the island. Signals of igniting fires on the top sent instant messages to Nicosia, Kyrenia, St Hilarion and Kantara. Buffavento represents a commanding observation post and a safe place of refuge. Through gatehouse the entrance to the lower ward is made, passing on the way the ruins of what is supposed to be barbican . On the left side, below the level of main buildings is the large cistern, now left in remains. Both the rooms in the lower level are roofed, the gatehouse has an under floor cistern . 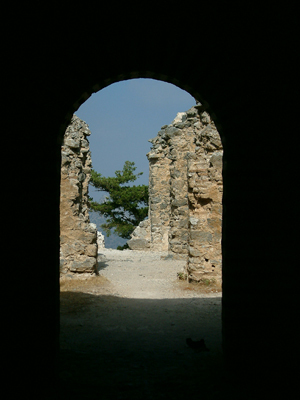 Another building on this level consists of little more than the remains of walls, and provides visitors with wonderful views over the Mesaoria Plain. The rooms opposite the entrance were used for storing provisions and as dormitories . The red brick workmanship on the arches of gates and rooms is of the Byzantine style. Little has remained of the church that used to be here. 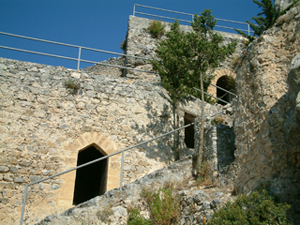 It is approximately 70ft (21m) to climb higher and you will reach the upper level of the castle, up to the roofless buildings of the highest point. From this point you will have a panoramic view and on a clear day you can spot Famagusta, Nicosia, the length of the panhandle and the Turkish mainland. A bold, daring feat of military engineering is using mostly the limestone rock form the escarpment on which it is built. 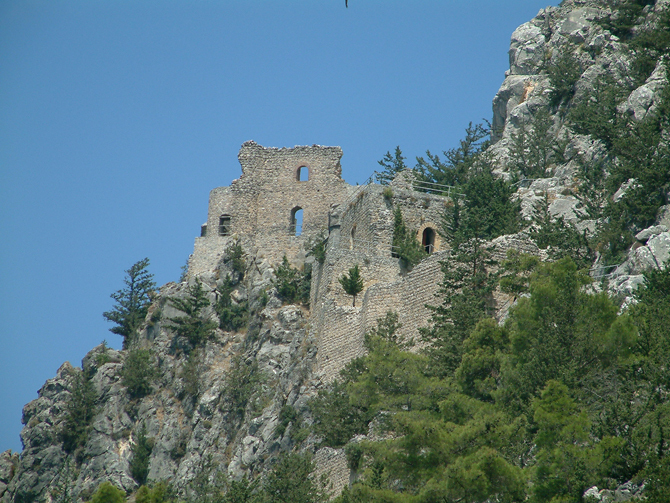 Comparing to St Hilarion and Kantara, Buffavento has no defensive structures as the height of the castle is tremendous. 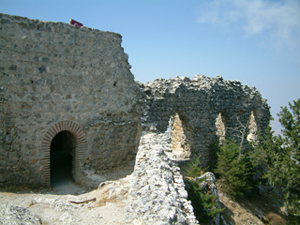 Similarly like at St Hilarion, the Venetians neglected Buffavento, rendering it useless and destroyed the stairways that led from the lower to the upper level. The stone steps have only been rebuilt during the 20 th century, making the climb slightly easier.